May 5, 2015 - TheUrbanMusicScene.com | Concerts & Festivals! 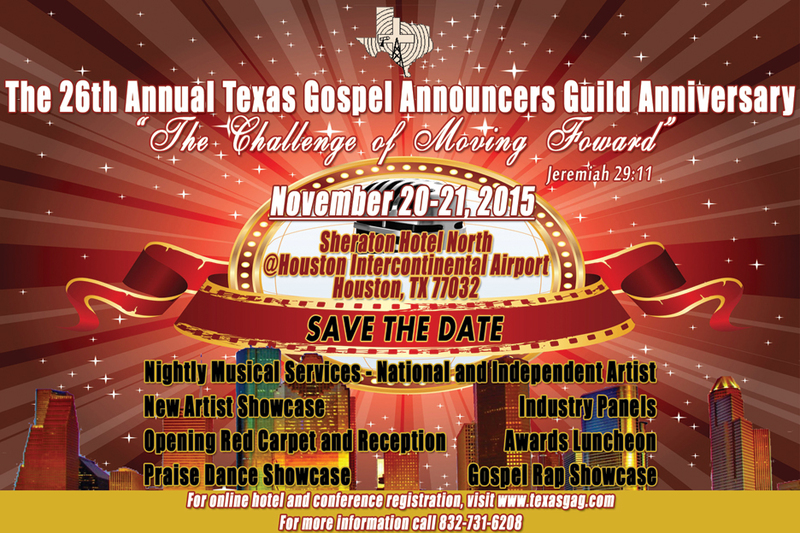 HOUSTON, TX (November 05, 2015) – The Houston Gospel Announcers Guild (HGAG) will host the 26th Annual Texas Gospel Announcers Guild (TGAG) Anniversary and Conference, Friday, November 20 – Saturday, November 21, 2015. The conference will be held at the Sheraton Hotel North IAH located at 15700 John F. Kennedy Blvd. Houston has become the new mecca for the music industry and during this conference the spotlight will be on gospel.